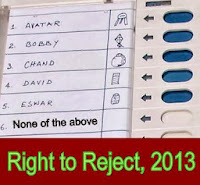 Supreme Court on 27th September 2013 gave the citizens of India the right to reject all candidates in elections. The judgement will be implemented immediately, and the "none of the above" option will be included in EVMs and ballot papers to be used in the upcoming state Assembly Elections later this year. The Conduct of Election Rules, 1961, already gives Indians the right to not vote for any candidate, through Section 49 (O). Under this section, used by a minuscule number of well-informed voters, voters can have their finger inked, then tell the presiding officer that he/she does not wish to vote for any of the candidates and this is then recorded in a register. 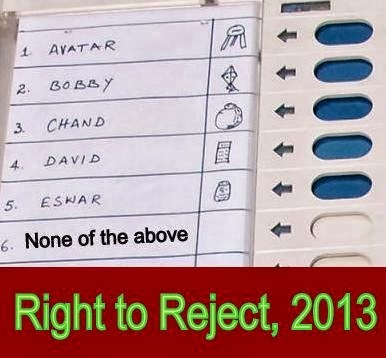 This implies that a voter declares openly that he is rejecting the candidates. The SC decision provides to citizens the right to a secret ballot even while exercising his right to reject all the candidates. "Democracy is all about choices and voters will be empowered by this right of negative voting," a bench headed by Chief Justice P Sathasivam said in its order on Friday. The judges said that this "would lead to a systemic change in polls and political parties will be forced to project clean candidates". Negative voting is prevalent in 13 countries and even in India, MPs are given the option of abstaining while voting in the parliament, the court said.